When I was fifteen I met a young man called Michael who invited me to lunch at the Plummer Roddis department store in Western Road. He was just a few years older than me and I felt rather posh being taken to lunch in a department store. Plummer’s was a store with several levels including a fashion department. I was a little smitten. He was a very nice young man and good looking too. Having been taught the etiquettes of table manners, correct knife, spoon and fork layouts, as I grew up, I felt quite the lady and fairly safe about dining in this rather nice store. However I must have been more smitten than I was aware and soon found myself faltering over the menu. We made our choices and food arrived including my side salad. Thrown even more as to whether to eat the salad from its own plate or pile it onto the main plate brought on quite a fluster. I am sure none of this was noticeable but it took a lot of my attention away from this charming young man. I knew Michael was going away up to York, to theatre school I believe. So next day I decided to send a thank you letter as a good gesture and a farewell note. I sat on my bed and scribbled my words, crossing out and redesigning as I went along. Eventually, having finally decided how the letter should look I took fresh paper and wrote everything out calmly. Having a post box just a few doors up from our house I put a stamp on the envelope and went out to post. I felt this was a nice round off. And, who knows, maybe he will even answer me, I secretly thought. Well my heart sank as I entered my room again. There on the bed lay the intended nicely written letter and gone away in the post was the well scribbled over practice run. Now embarrassment really set in. I was quite insecure about life as it was but this really took the biscuit. But back then, 1961, I was still finding my feet and openness was not my best talent. So I never did re-write but I often wondered how this young man was getting along and what he must have thought about such illegible scribble. In later years I saw him in one of our local Brighton papers as having taken part in a theatre piece somewhere so I was happy to see his progress. But I still get that tinge of excitement and frailty mixed up as I recall my lunch date on the upper floor in the store of Plummer Roddis. I worked at Plummer Roddis when I was 16/17 on the handbag counter with a very nice lady called Mrs Dare. Store Studios had photo studios in most of the larger stores and my mother ran their photography studio at Plummers. She was there from about 1938 until sometime in the War when she started her own portrait studio under the name ‘Portraits by Paula’. No-one now can tell me why she used the name Paula as her name was Doris! I never thought to ask and of course as with a lot of these things it is too late now. I was merchandise secretary at the store in 1971, my office was not much bigger than a cupboard. General manager was Peter Millington, formerly the manager of Plummers in Boscombe – for reasons I can’t remember, we called him Pete the Face. Display manager was John McAtee. A great bloke called Jerry was department manager of household goods. Can’t remember the name of the lovely young woman who ran children’s clothes down in the basement. In 1971 Brighton was in full hippy swing. I married my French girlfriend and we were lured to Bury St Edmunds where I managed a petrol station. Does anyone else have memories of Plummers Brighton in the late ’60s and early ’70s? I worked at the Plummer Roddis head office next door in the beautiful Sillwood Hall from 1968-1971. I was the coat buyers assistant for the 17 stores in the group, they were wonderful days and we used to be dragged over to help out in the coat department on the first day of sales! Can only remember Chrissie from the switchboard who married Eric Marchant’s son and was given a house for a wedding gift from the in-laws – mine gave me a dreadful canteen of cutlery! I have really fond memories of the Store and the lovely restaurant, but I must say it was exactly like Grace Brothers in Are You Being Served? The building was connected to Sillwood Hall and also the houses in Sillwood Road, where the office manager George Wilkins resided. I left Varndean in July 1948 aged 15. I wanted to be a window dresser at Plummers, but they wouldn’t employ me until I was 16 at the end of August, then because they had no vacancy for window dressers, they took me on in the blouse dept. as a shop girl. I spent a lot of time in the basement ironing new stock as it came in so that it could be put on display in the department upstairs. I remember having to de pill a customers jumper she brought back because it had bobbled in wear. Then I steam pressed it till it looked like new again! We were always so polite to ‘madam’ (customer) and had to tell her how nice she looked in the garment she had tried on in the individual fitting room. We earned commission on sales we made, but basic wages were about £3 a week. I left home at 17 and paid £1 a week rent and had to eat in the canteen and buy my needs out of the rest. I then was later given the skirt dept. And later when they needed someone in the office upstairs I applied and was accepted. I had had evening classes in bookkeeping and typing and had to learn the rest in bought ledger. We had a great social club too, ladies cricket club and cycling club and rambling. We had parties in the canteen and fancy dress balls. We were able to have our photos taken in the photography dept as models to train new girls in the art. I have a quite glamorous one and one in my working suit. I remember buying my first pair of nylon stockings when they were first invented. It was a great firm to work for. In 1968/69 I remember going to Plummer Roddis with an older friend every Saturday for the 3pm Mannequin Parade and having delicious afternoon tea of fancy sandwiches, and cream cakes whilst we watched the fashions of the day. What wonderful memories they were - transport me back to Brighton in the 1950s/60s anyday. 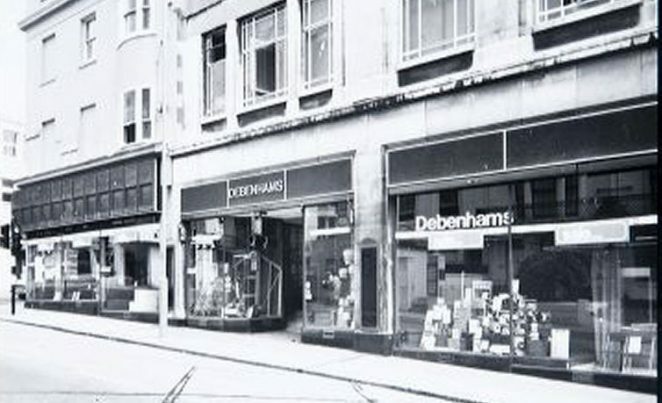 I worked at Debenhams, I believe it was formally called the Army & Navy stores. I was there around 78 to 79 in the hat department. I remember my boss, a lovely, kind lady, Joyce Wright. She became very ill while I worked there and died from cancer just after I left to train as a nurse. I often think of her, even now because of her kindness to me, and remember her love of hats and the excitement she felt going to London. my time there was very happy. Just out of curiosity, what was on a typical menu in a restaurant in places like Plummer’s, in the 1950s and 60s? Come to that, what was on the menu of other restaurants, in Brighton, in the 40s, 50s and 60s?